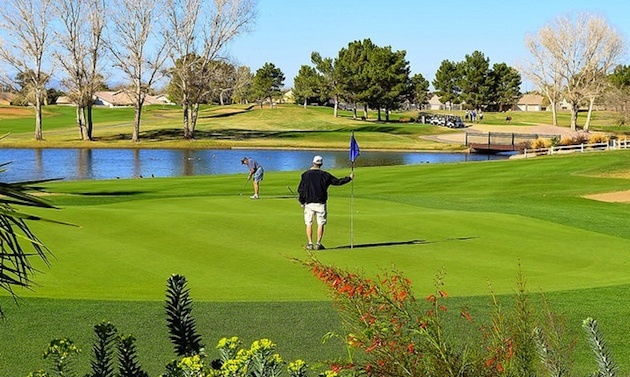 The RV Golfer visits Viewpoint Golf and RV Park in Mesa, Arizona. 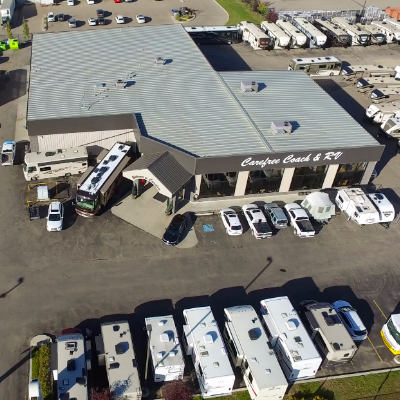 Every year thousands of RVers make their way south to escape the cold Canadian winter. The vast majority of snowbirds end up in one of the many mega RV parks in Arizona. 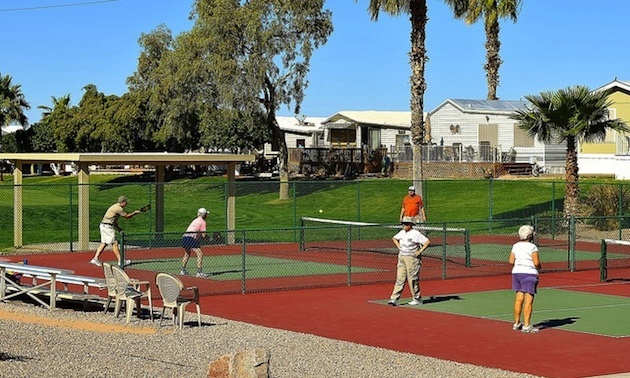 Some of the more well-known mega parks include Cocopah Bend RV Resort in Yuma, Voyageur in Tucson, Palm Creek in Casa Grande and Viewpoint in Mesa. If there is a preferred location for snowbirds, Mesa is it. The word mesa refers to the flat table land between Phoenix and Apache Junction. 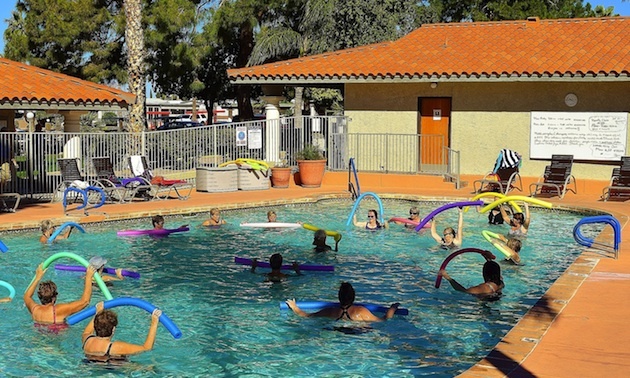 As Mesa is primarily a residential area, the numerous RV resorts blend into the landscape. Mega RV parks are largely self-contained, with a myriad of activities and entertainment. There seems to be little reason to leave the park other than for shopping or being a tourist. Viewpoint is a 55-plus adult community that consists of 1,780 sites, all of which are either park model homes or serviced RV sites. This mega park offers a unique lifestyle, similar to living in a small village. There are 1,500 annual residents returning year after year to visit friends and renew activities. The park even has its own chain restaurant, Fat Willy’s Clubhouse Pub & Grill. Viewpoint is owned by Encore/Equity Lifestyle, a company that owns and operates 170 RV resorts and campgrounds throughout the United States. The resort has been selected as one of the best RV resorts in Arizona and the nation by Woodall’s North American Campground Directory. .
Life’s a party is the motto of Viewpoint. Looking at their activities guide you’ll see an impressive list of concerts. Every week between January and March, tribute bands take the stage in the Grand Ballroom. The list includes tributes to Abba, Shania Twain, Tim McGraw, Barbara Streisand, Barry Manilow, Rod Stewart, Michael Buble and many more. On Tuesdays the dinner shows feature local entertainers such as the Arizona Dueling Pianos. Wednesday is Music on the Green, an outdoor concert series in one of the three parks. Thursdays are reserved for the Country Store and a vendors market, while the weekends are booked with special events including a Welcome Back Dance, New Year’s Eve Party and Mardi Gras. If music is your interest, join the Viewpoint Concert Band or the Classic Chorale. This gated community has many amenities, including three swimming pools, three spas, 10 tennis courts, a softball field, five pickleball courts, shuffleboard and dog walking trails. A fitness centre, library, laundry facilities, convenience store, post office, beauty salon and massage therapist round out the excellent facilities. There are 150 different clubs and classes listed in the activity guide, including arts and crafts, fitness and exercise, dance classes, computer and technology, and sports, cards and games. Special interest groups include model aviators, genealogy, something called the “Moaners and Groaners,” silversmithing, stained glass and lapidary clubs. If Viewpoint does not have your special interest, you are welcome to start your own club. Two golf courses are the centerpiece of the resort, including a 9-hole executive course and an 18-hole championship course. Both courses are open to the public and very player-friendly. The executive course is only 2,162 yards from the back tees and 1,666 yards for women. The longest hole is 330 yards and the shortest is 103 yards. The course rating is 60.7 and the slope is 94. Only one hole has a water hazard, but there are 15 bunkers. This is a good recreational course, appealing to beginners as well as experienced golfers who want to work on their short game. The championship golf course is not a PGA course, but is a good resort course for the 55-plus crowd who like to walk. The fairways are very generous off the tee, lush and tree-lined. The greens are not overly large, but are slanted mostly from back to front and are manicured, undulating, and very fast. There are 40 bunkers strategically placed around the course that require good course management. 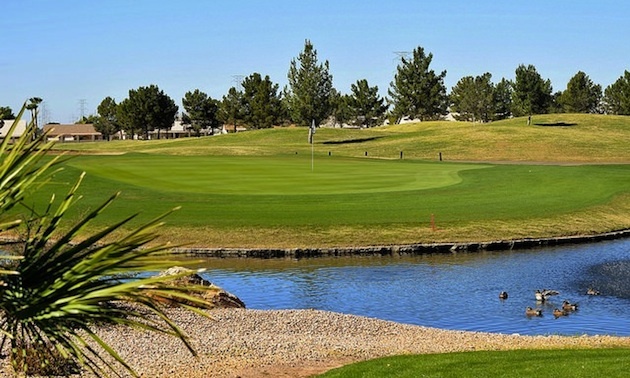 Water can come into play on nine holes, especially on 3, 9, 13 and 18. The course is not overly long, being only 6,324 yards from the back tees, with five par 3s and a par of 71. The longest par 5 is only 506 yards and the shortest par 3 is 168 yards. Most golfers play the blue tees at 5,660 yards, with a CR of 69.2 and a slope of 113. Viewpoint is a public golf course offering winter memberships and punch cards for its residents. The course also offers leagues for both ladies and men, as well as special tournaments such as Canada versus the USA in the Ryder Cup. Shotguns starts are common in order to accommodate as many people as possible. 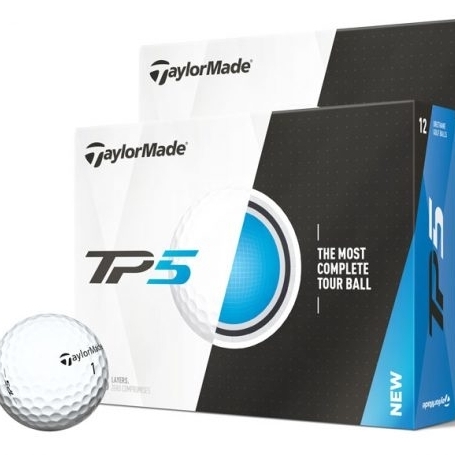 The pro shop is well stocked and PGA instructors are available. 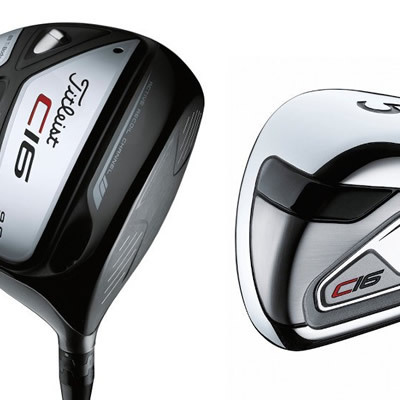 Titleist has designed and produced a new driver and irons that has stretched technology.